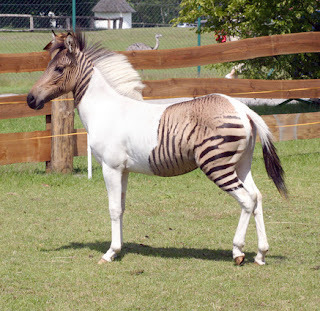 Picture taken at the Safaripark Stukenbrock, in Germany, shows Eclyse, a crossbreed between a zebra and a horse in an enclosure at the zoo. Eclyse was born in a horse ranch in Italy, her mother is a chapmann-zebra, her father a brown-white horse. And I think that's neat. I wonder if she inherited her father's docile nature or her mother's aggression? (Zebras, if you didn't know this bit o' trivia, are the zoo animal most likely to attack and kill zookeepers - so says Jared Diamond).